As an add-on for the Snow White (by AAW Games/Adventureaweek.com) Kickstarter campaign, I designed a pair of dice. 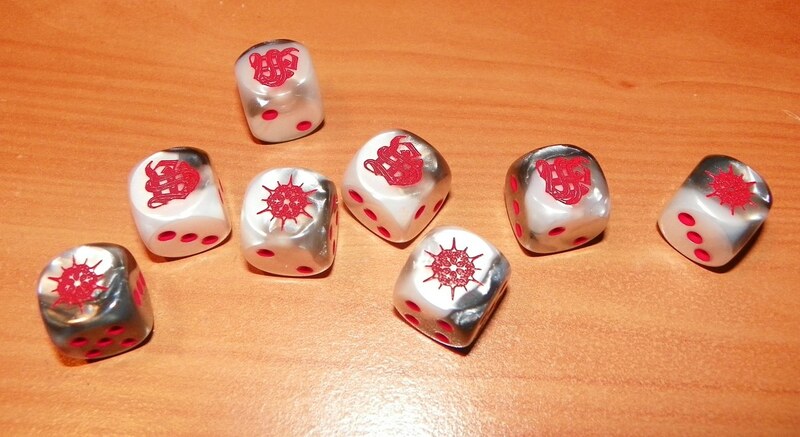 The two designs are engraved and set in blood red ink on snowy-white/stone-grey dice. The first is a unique snowflake design, and the other is the official Snow White logo I designed (a calligraphic S superimposed over a calligraphic W. The limited edition dice were sold in pairs (one of each) as a $10 add-on product during the campaign.